New for 2014, Speed and Strength introduces the American Beauty, the Heart and Soul and, of course, the Wicked Garden jacket! If you haven’t already gotten the gist via their colorful names, the first two jackets are part of their new Authentic American Collection. Each offers a little something different in terms of function, but the style is classic, American and may leave you feeling a little nostalgic. So, let’s break it down. The Speed & Strength American Beauty Jacket is offered in two colorways. I’ve taken the liberty of renaming them. Let’s see if you can figure it out! We have Classic Harley and American Retro Party! The perforated leather is a nice touch, but the jury is still out on the stone-washed look. Paired with jeans, will you look like an 80’s babe or an interesting attempt at a Canadian Tuxedo? Either way, you’ll be making a statement. That statement will be on your forearm and it will say American Beauty! Alternatively, the Heart and Soul jacket is a little more subtle. It will be offered in classic black, a sporty black and white, and the recently beloved retro stone-washed look. And let’s not forget, there’s a little heart and swirl design on the right arm to boot. 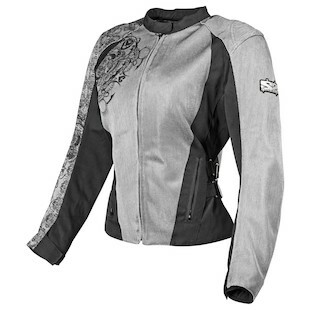 The American Beauty and the Speed & Strength Heart and Soul are great jackets for Spring and Fall. 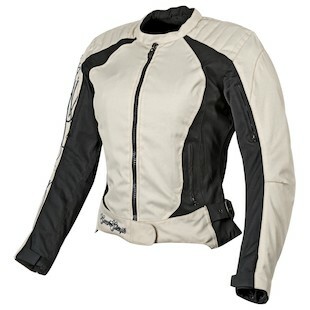 Equipped with full-sleeve thermal liners, both jackets can be ridden into slightly colder weather but neither will flow a ton of air in the summer. Your points of ventilation on both will be at the arms only, regulated by zippers for your convenience. Each differs a little in fit though. The American Beauty has a little more adjustment above the hips and the Heart and Soul adjustment straps sit lower for a more athletic look. The Heart and Soul will brave the elements a little better as well since it is water-resistant. The American Beauty is not. Surprise, surprise. Beauty and function don’t always co-exist but your spirit will persevere! It seems there’s a bit of wisdom behind these names, no? Finally, we have the Speed & Strength Wicked Garden Jacket. 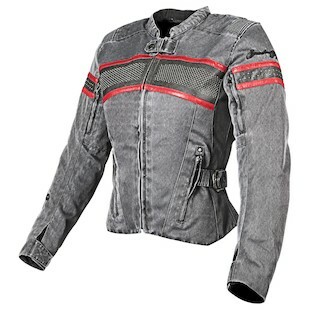 Falling in line with the rest of the Wicked Garden collection, this jacket is predominantly constructed of a abrasion resistant mesh and is clearly designed for summer. In addition to four colorways and a feminine fit, the Wicked Garden is also finished with the collection’s signature design along the right arm. But Speed and Strength has just one more trick up their sleeve- each of the styles mentioned includes a CE approved Spine Protector in addition to the CE approved shoulder and elbow armor. Boom! All in all, you just can’t argue with comprehensive protection. What you can argue with is ashy denim reminiscent of your youth. But why fight it? Scrunchie, Reeboks and leggings sold separately.